Although our current home is not small (6000 sq ft. ish), it is a downsize from our house before it. Because of that, we really wanted to utilize every room and make the most of the space that we have. The interesting thing about this house is that there is no real entryway, so when you walk through the front door, you walk right into the family/living room. We don’t have a separate formal living room, so I needed this room to be beautiful, but also functional. I wanted it to be a pretty room for when I entertain guest, but also be a cozy place for my family to curl up at the end of the day and watch TV together. This room had a lot of expectations riding on it. We developed a floor plan so that I could see how everything would fit before we started doing any work. The first thing we did was look at the layout of the room. The fireplace was original to the house but it had emerald color tile all around the base, which was NOT Living with Landyn. We ended up getting some Ann Sacks tile arranged in a herringbone pattern in all white. I wanted to keep the original fireplace in all the molding details on it, so to freshen it up a bit, we wallpapered the part that extends off the fireplace from ceiling to floor in a textile wallpaper. It is almost like a mens suit, with a herringbone pattern as well. It is a cream color, so yes, I did cream on cream colors, but I wanted to keep the room light and bright. We flanked each side of the fireplace with two chest from Gabby and while I was out shopping for accessories, I came across these beautiful medallions that came off a building in France. The medallions were put on to linen fabric and framed in acrylic. I bought three for one side of the fireplace and three for the other. I love the story that they hold, but unfortunately I don’t think it is something that is available anymore. I got them at Providence Interiors in Nashville. When I walked into the store, I just fell in love with them and I didn’t know exactly where I would put them when I got them but after we got the furniture, I knew they were perfect. The symmetry of the room is very aesthetically pleasing. Underneath the medallions, we just did some simple white books, a chuck of white coral and a couple brass lanterns. That wall is such a focal point when you walk into the room. So even though we don't have a formal entryway, that wall just catches the eye and draws you in. I am so happy with the way it turned out. The next task was figuring out how do we arrange the seating. Normally Steve and I would cozy up in a big chair and the kids would take the couch. Homegirl Annie was so wise in deciding that we should have two couches that sit lengthwise from the fireplace and anchor them with two really nice size chairs at the end. It is a great look and we put a fun ottoman at the foot of each. My only request was the the ottoman actually be a cushy place you'd want to rest your feet on. There is nothing worse than a big chunky wood coffee table that is pretty, but not something you’d want to put your feet. We also got two benches and put them right up next to each other so that is has the look of a big coffee table. So if you are struggling to find a coffee table you like, try and find two really great benches and make your own! Then just get yourself a nice tray and a few little accessories and a couple of books. You can even change out the accessories seasonally, and who doesn’t love that? Here is another trick you can steal, the carpet in the living room is actually a Stark Carpet and it is a tight knit wool blend that we had bound and surged on the edges. It is actually carpet that is cut custom to the length and width of the room that we wanted. I learned from Annie that you want your furniture to anchor down on the rug. It is 13x13 which allows those two couches and two chairs to have a place to live right on top of that beautiful rug. It is a white rug and some people shudder with fear at the thought of that, but it really has done us well. It is soft, it cleans up nicely and I am just a sucker for white. Going with a darker color would not have been something I would love has much as I love this white rug. I don’t allow eating in there and I make sure we don’t wear our shoes in the house, so it truly has held up well! It is almost five years old and still looks incredible. The back wall where the bookcase currently stands was originally the home of a huge buffet piece that I bought from a consignment store here in Nashville called Clearing House. It was HUGE! It took nine guys to carry it into the house and I had two big lamps on it and some books. I loved it, but it was a little too ornate for me. Once I got into the house and really started to develop my style into what it is now, I realized I wanted something more modern. I had always wanted a floor to ceiling bookshelf and I now had the perfect place to put it! 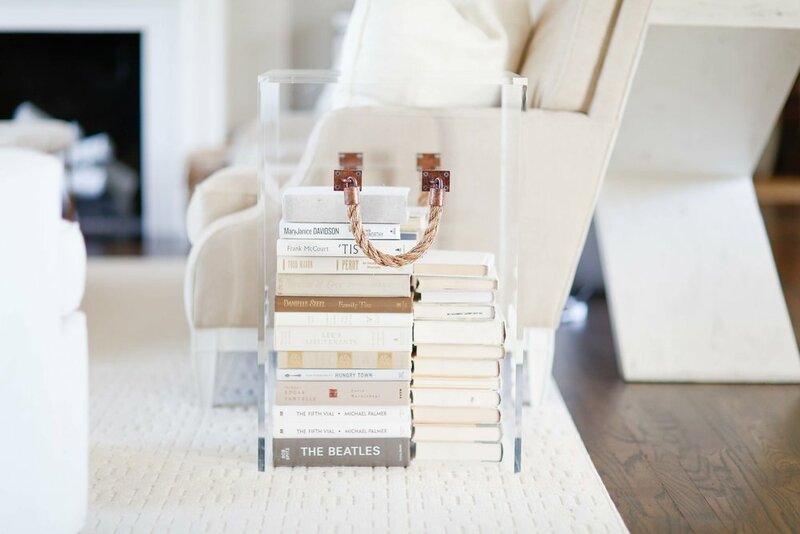 Bookshelves are timeless and had always been something that would grab my eye when looking through a magazine. So I enlisted Mister (Steve’s dad) to help me make it happen. I had seen this IKEA hack on Pinterest and I knew Mister could make it happen. So we bought four Billy bookcases from IKEA and Mister created a stunning bookshelf for us. It is one of my favorite things in this home. Here's the post on all that. We added brass picture lighting and Mister installed electric so they can switch on and off. There is not a ton of lighting in this home, so adding the picture lighting toward the back of the room really added some light in the evenings. I am still working on filling it with white books, which is a task...but I really love it and Mister did an amazing job. I mean. We did put one console table behind the couch and a chest. The chest is something fun that I got from Annie. It is acrylic and we stacked books on the floor and set it over top of them. It is a really great piece that adds a modern touch that almost feels like a work of modern art. If you have been following me for a while, you know that this is not what the living room looked like when we first moved in! When we moved in, we were just getting back from a vacation in Mexico and I was tan, drunk and happy! HA! Plus I was about to move to the South, and I was like...I'm gonna embrace my southern roots. Give me all the color + florals. I proceed to pick out TONS of color. Coral colored ottomans, big floral curtains that looked incredible on a swatch but almost gave me a heart attack when they actually got hung up. Please tell me you remember that?!?! But I soon realized that I am a plain girlie and I should have stuck with what is in my heart and what works. So I learned my lesson there and now one of rules of design is GET WHAT YOU LOVE! Wake up everyday and look at whatever that item is and love it, otherwise you will regret it. That is my advice to all of you! Keeping it neutral allows me to switch out pillows and accessories from West Elm + HomeGoods + Target and my very own curated home collection with Painted Fox Home. Did you even know I had one? Go check it out! That way I always have a blank palette to work with. Anytime a change of season comes around, it is great to not be tied to a color sofa or paint color that I have to focus all of my decorations around. Getting a neutral sofa would definitely be my recommendation as well as swapping things out for less money, like a throw or pillows or cute accessories. I finally got the curtains that I really wanted, which are just white. Simple and white and I got them through Loom Decor. They are fantastic. You can get custom curtains form them in ten to fourteen days. What!? What?!? Yep! Mine are just a pretty white, linen curtain and I was able to use the same brass hardware from the original curtains. All in all, it is clean, simple, sophisticated, chic, modern and one of the best rooms in the house. When I wake up in the morning to go get my coffee, it is just a bright, fresh area and I absolutely love it.